We Mean Business > d i v e r s i t y w o m a n . c o m W i n t e r 2 0 1 9 D I V E R S I T Y W O M A N 27 You might also join a local or regional chapter of a major national nonprofit or a major "cause-related" association such as the Muscular Dystrophy As- sociation and lobby to get profit and loss experience there. Eco- nomic development groups at the local, state, or regional level are valuable as well, he offers. Nagel has found that boards are becoming less strict today about this experience, however. ey're "starting to recognize that it's an arbitrary guideline that no longer makes sense," especially since companies are looking for people who have insight into different areas, she says. For example, usually a person with legal or HR experience doesn't have profit and loss experience, but if the board is looking for someone with legal or HR experience, is it going to skip someone who's top-notch in her area because she doesn't have profit and loss experience? She thinks not. 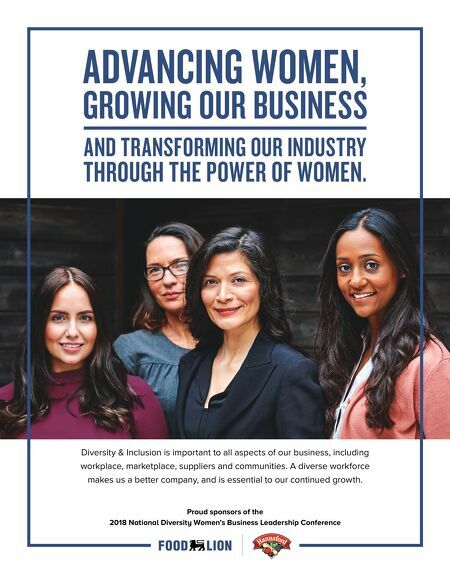 Legislating board diversity Legislation passed in California in Septem- ber 2018 requiring public companies to include women on their board is ground- breaking—and not without controversy. Legal challenges are expected, and opin- ions vary about the effectiveness and wis- dom of trying to legislate board diversity. Archambeau flat out says she doesn't like those kinds of laws. What about ethnic and international diversity? she asks. "If I have six board members, do I need to make sure I have one seat for a Hispanic and one for an African American? If I have 10 seats, do I need one for a Native Ameri- can?" She thinks it's a slippery slope and prefers to lobby "for shining a spotlight where things aren't operating the way they should." Investors are now saying, "Here's what we expect," which causes people to act properly, she says. Ward predicts that the California law is going to have more repercussions than di- rect influence because, relative to the entire state, only a small number of California companies are out of compliance. However, he says, "it's going to prod other states to act." He also has concerns about the law. For example, if your corporation is in Cali- fornia but is chartered in Delaware, what will that mean in terms of compliance? At the same time, he notes the difficulty women have when networking to obtain a board seat. He's found they start two steps behind men. "Men tend to choose others who look like them, and too often the board can end up with another 'pale male,'" he observes. e path to a board seat involves effort, but achieving the goal can be well worth it. Some board positions pay very well, and can lead to seats on other boards, as happened with Archambeau. Board members have also been tapped for the CEO position at that company when it opens up, or the top position at other companies. DW Carolyn M. Brown is an award-winning journalist, author, and playwright. She co-authored the career self-help book Climb: Taking Every Step with Conviction, Courage, and Calculated Risk to Achieve a riving Career and a Successful Life. Gaining Experience: Nonprofit Board Service M arilyn Nagel, chief learning of- ficer of SAMI, a company that uses a gaming approach to learning, serves on two nonprofit boards. One is the board of Ceres Community Project, which provides food for people dealing with serious illness. The organiza- tion's mission and vision resonate with her, she says. Serving on a nonprofit, like serving on a corporate board, offers benefits. Nagel points out the following advantages. 1. It provides leadership experience you won't get in your day job. You have a voice as a director, as a leader, and that's very different from being an employee. You're also learning about board governance and how boards function. 2. It expands your network, since you're also working with leaders who are board members. 3. It gives you an opportunity to show what you're passionate about. Fortune 100 to Fortune 500 companies want their employees to participate in community service, and serving on a nonprofit board is one of the most prestigious ways you can do that. 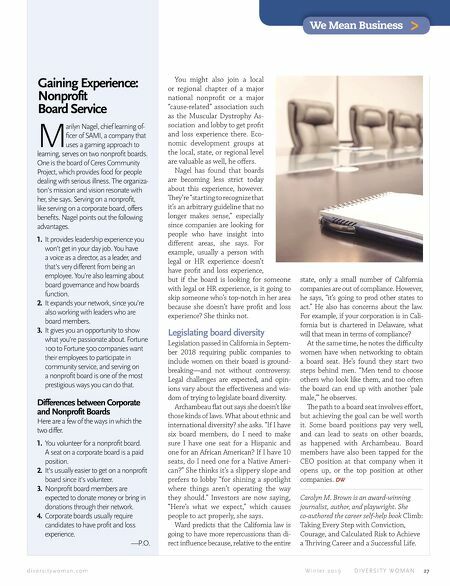 Differences between Corporate and Nonprofit Boards Here are a few of the ways in which the two differ. 1. You volunteer for a nonprofit board. A seat on a corporate board is a paid position. 2. It's usually easier to get on a nonprofit board since it's volunteer. 3. Nonprofit board members are expected to donate money or bring in donations through their network. 4. Corporate boards usually require candidates to have profit and loss experience. —P.O.